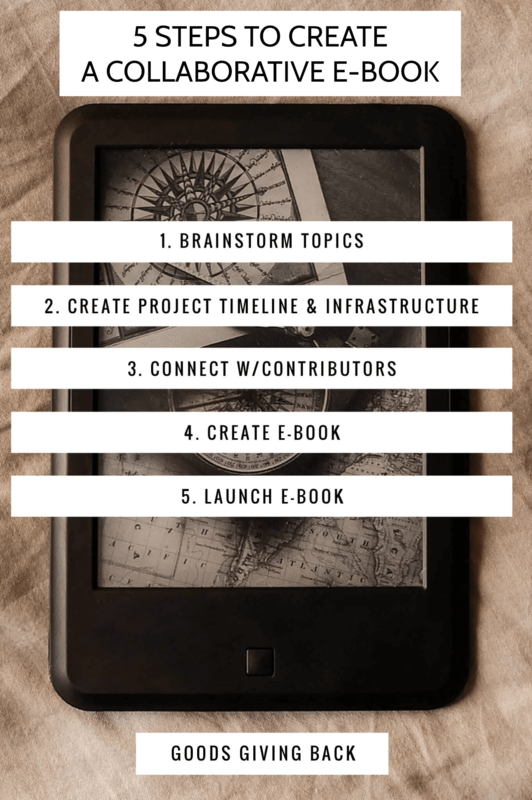 For a collaborative e-book project to be successful, it’s important to have an infrastructure in place that makes it easy for people to interact and contribute. So I want to share details about six free project management tools that are sure to set your project up for success. First, however, take a look at the image on the right which provides a recap of the five steps in this collaborative e-book series so you can see what has already been discussed and what comes after this “timeline and infrastructure” step in the overall process. If you want to start the series from the beginning, you can read Part 1 and Part 2 before jumping into Part 3. A collaborative e-book involves a group of people working together (typically as a virtual team) to create a finished product. 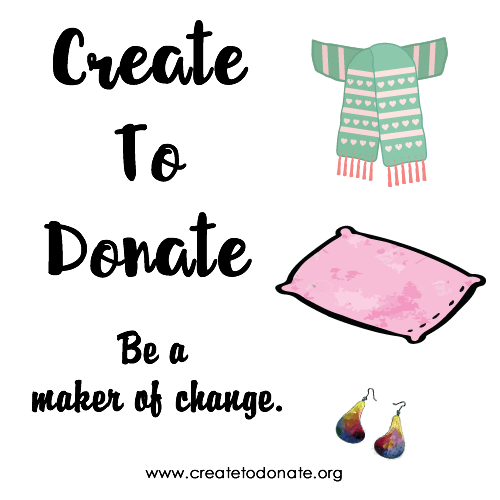 As a small non-profit or small business, you will most likely be working with people who aren’t part of your organization but want to do their part to help. To stay on track, it is essential to have straightforward processes in place. Before you start using tools to put project management processes into place, you have to create a realistic timeline. This timeline, at a high level, should include the amount of time you will need for contributor solicitations, content collection, and e-book creation. With the right processes and tools in place, a collaborative e-book from start to finish can take as little as eight weeks. To meet a tight time frame like an eight week goal, it is also essential to set and follow through with the key dates and milestones you’ve established and communicated. Once the timeline is set, you can start setting up your project infrastructure using free project management tools. 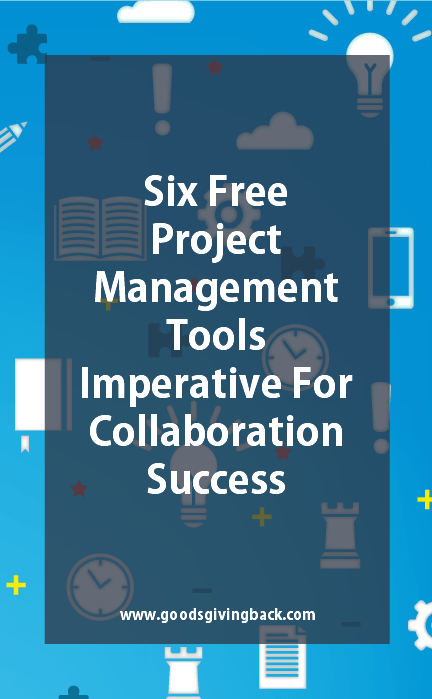 There are all kinds of tools available so to narrow it down, I am highlight six free project management tools that will make it easy to create your collaborative e-book. There are a variety of form-building tools out there, but my go-to has been Typeform for a while now because the forms are not only easy to build regardless of your technical know-how but also have a fluid user experience. For your e-book project, you would use Typeform to build a single form to collect all of the information and content necessary to create your product. Building a form with a tool like this not only allows you to send the same, exact link (and form) easily to every participant, but it will also combine all of the responses into a single document for you when your collection stage is complete. When you’re pulling together a project plan for a collaborative e-book, it doesn’t require a complex project management program. Your best bet is using a spreadsheet program to document and communication key dates and milestones. The rows and cells make it easy to read and you can outline the key activities and dates using font size and color coding as you see fit. MS Excel is often the default for many people (myself included). If you’re looking for free options with easy sharing capabilities, however, Google Sheets is a great option. Not only will you use Google Sheets for your project timeline, but will also save your information from each of the collected forms a spreadsheet. In addition, if you want to track “assets” (i.e., the graphics and images people submit) using a spreadsheet is a straightforward way tot do it. Typeform will take care of collection the key pieces of information you need, but what about collecting and saving any graphics, images, or related documents you may need as part of your collaborative e-book? Enter Dropbox. Use Dropbox to create a folder structure in the cloud and have each of your contributors save their graphics and documents in a specific folder you. For a project like this, I recommend creating a separate folder for each contributor so that you can clearly keep track of each person’s contribution. I realize this isn’t a truly “free” tool since someone has to pay for the notebook and the pen, but it still falls within one of my more important project management tools. Documenting your ideas offline is always a good process because putting a pen to paper offers a visceral integration that using a computer does not. Not only can you use your notebook to map out a super high-level project plan very quickly, but you can also brainstorm ideas for contributors, visual design, and the marketing of the e-book without committing to any one idea. And if that doesn’t work for some reason, it’s always a great tool to have on-hand for doodling when your brain needs a break from all the planning. Speaking of using images as a way of communication, if you are a visual person Trello is a valuable project management tool. You can use it for, among other things, timeline and asset management. Create Trello boards and place cards on them to design a streamlined view of the project. Using Trello will keep everyone informed about the milestones, outstanding items, and major deadlines. Each of your contributors will to have to have a Trello login unless you sign up for “business class” which would allow anyone without a Trello account to be an “observer“. After reading through this list of free project management tools, you’re probably saying to yourself, “Wow. This seems like a lot of different tools for a little project.” The beauty of these tools, however, is that once you set many of them up, they do the work for you. This doesn’t mean that we can’t add some additional automation into the process, though. Using a tool like IFTTT (IF This Then That) will provide you with key notifications throughout the collaborative e-book project as well as act like a virtual assistant by completing tasks for you. Use IFTTT recipes to add a new Typeform submission to a spreadsheet or do more with Dropbox. For many people embarking on any collaborative project can be stressful. And since most people have never created an e-book it becomes even more daunting. Using free project management tools like the six detailed in this post is one time-tested way to provide peace of mind for you, your project team, and your contributors. What are your favorite free project management tools? Please share your thoughts in th comments below. These are great tools! I just started using Trello and it’s amazing!